Dramatic shifts in workplace norms as a result of remote sales teams are now a reality, as field-based personnel perform so many vital selling and strategic account management business functions, more effectively armed with tablets than ever before. Aberdeen research conducted for Sales Performance Management 2012: How the Best-in-Class Optimize the Front Line to Grow the Bottom Line (December 2011), shows that 60% of companies’ sales team members are primarily remote workers. 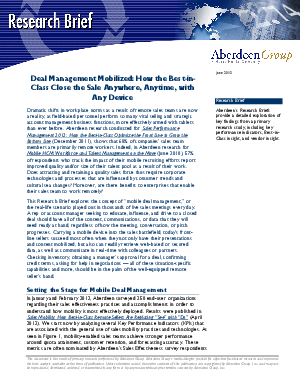 Indeed, in Aberdeen research for Mobile HCM: Workforce and Talent Management on the Move (June 2010), 57% of respondents who track the impact of their mobile recruiting efforts report improved quality and/or size of their talent pool as a result of their work. Does attracting and retaining a quality sales force thus require corporate technologies and processes that are influenced by consumer trends and cultural sea changes? Moreover, are there benefits to enterprises that enable their sales team to work remotely?